Social media is no longer just a passing fad or a side note in an otherwise large marketing effort. It is an integral part of the way companies do business. As a result, it is also an integral part of the way companies do marketing. The most valuable brands in the world spend an inordinate amount of time planning out and executing their social media plans. So how can you keep up with them? The answer is simple enough: project management tools. Even the most organized social media manager would not be able to keep up with the demand for social media calendars, content creation and collaboration without the use of project management software. If you are new to the field, consider these top 9 project management tools as you get started. There are two major types of project management tools for social media managers: those that help manage the social media itself, and those that simply help the manager get organized. Sprout Social is the former. It is an all-in-one social media management tool that helps teams “monitor, respond, measure and collaborate to ensure smarter and faster communication.” In the age of information, that’s not a bad promise. As the name would imply, CoSchedule works primarily as a marketing calendar. The software has one major goal: out with the old and in with the new. The old way of social media management involved spreadsheets, countless email chains, and many moving parts. The new way involves a project management tool focused on social media. The software features a drag and drop calendar, a collaboration platform, and even WordPress and email integration. Evernote falls into the second category of project management tools for social media managers: the kind that helps managers stay organized and on task. Did you find an interesting piece of content you’d like to save for later? Have a thought on the bus that you don’t want to forget? Want to share content calendar ideas? Evernote can help with all of that. The productivity software doubles as a project management tool in that it allows individuals and teams to keep track of their social media plans on an integrated and collaborative platform. This online tool may look like a collaboration tool at first blush, but it can serve as an invaluable project management tool when it is used right by social media managers. Rather than endless email chains, managers can assign work using the platform’s card system. More than that, teams can collaborate within the cards themselves. For a marketing team that pulls from many individuals, Trello can help get social media content ready and scheduled faster. Built as a solution to task management, Wunderlist is an invaluable project management tool for social media managers. It is simple in its purpose but incredibly valuable for productivity. Social media managers must constantly update their to-do lists, their social media calendars, and their deadlines. Wunderlist is a simplified approach to handling the issue of changing priorities and to-dos. More importantly, the project management software is made for built-in collaboration, which means that social media managers can share lists with others on the team. Like Trello, Asana is focused on teamwork. The software makes working through tasks as a team much easier by breaking up tasks by responsibility, priority, next steps and more. The tool also allows social media managers to see the big picture, across multiple teams, platforms, and projects. As a result, Asana lets managers address any holes in a social media content calendar – all on the single platform. HootSuite is the name brand in social media management, and its Professional offerings bring leaders to next level in project management. The Pro platform helps small businesses and entrepreneurs find and schedule content, engage with their social media audience, and track analytics for greater success. The Pro option allows the simultaneous management of up to 10 social media profiles, along with a top-notch analytics platform. This online tool simplifies both project management and social media content scheduling for managers. The platform lets managers engage with their audience within the tool – in other words, you can reply to a Tweet and respond to a Facebook message without changing accounts or pages. Like any good social media management tool, AgoraPulse has a collaboration tool. Managers can assign roles, individual tasks, and monitor the progress of their team. Like many of its competitors, Zoho Special combines social media content with project management tools in a single platform. Managers can easily schedule out editorial calendars, review social media analytics, and assign projects to their team using the Zoho Social platform. The software’s strengths include a user-friendly interface, collaboration tools, analytics and real-time engagement tools. 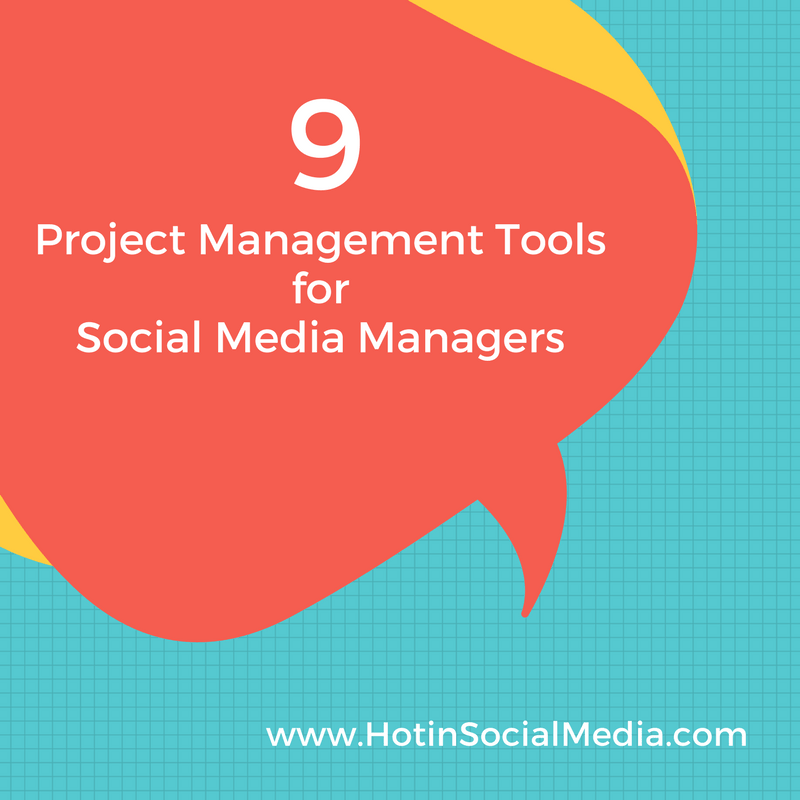 It can sometimes be difficult to know which project management or social media tools are right for you. If you are a social media manager, feel free to check out TrustRadius for great information on the best project management tools available this year.